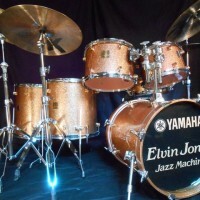 This 18″ bass drum was custom made for Elvin Jones in 1996 for appearances with his Elvin Jones Jazz Machine band. This is not a reproduction. This is the real thing acquired directly from Elvin’s wife. It is one of several Elvin used between 1996 and 2004. Includes COA signed by Elvin’s wife and seller.